On Saturday 9th June, in partnership with the Eco Centre’s award winning education service and the on-site fabulous cycle hire service, World Environment Family Day took place. It was a glorious day, celebrating all things environmental and the 10th season of Southport Cycle Hire and we could not have asked for better weather. Active Travel were also on hand offering lots of advice and information about walking and cycling. Our legacy sculpture being designed. As part of the day, people had the chance to contribute to the design of a legacy sculpture Made from reclaimed bike wheels which will now be on permanent display in the Eco Centre. 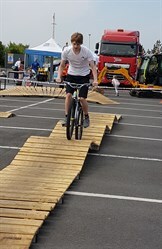 Our wooden cycle ramp course took centre stage and we had lots of children as well as mums and dads having a go. 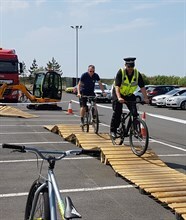 Dr Bike was on hand offering free health checks to anyone who brought their own bike along and Merseyside Police Safer Roads Problem Solving Team came along to showcase their Close Pass Initiative demonstrating safe passing distances for cyclists. The event was also supported by several community groups and organisations including the soon to be new neighbours of the Eco Centre, Southport Lifeboat. Also in attendance were RSPB, local scouts groups and the Gillmoss Recycling Discovery Centre. 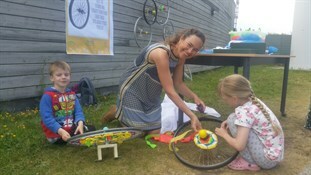 There were also prize draws, free eco-friendly gifts and special offers on cycle hire. If you came along, we hope you enjoyed it.